Neutrals can sometimes seem dull, but not when you layer on the texture. A variety of textures can create interest and pizazz. There are many more interior finishes that add texture to a room, especially when you layer the look. Think a soft rug atop a hard tile floor or fuzzy throw pillows over a smooth fabric sofa or a rough brick accent wall surrounded by shiny painted walls. Don’t let your all-neutral color scheme slip into ho-hum blandness. Add beautiful textures to enhance your interior look. 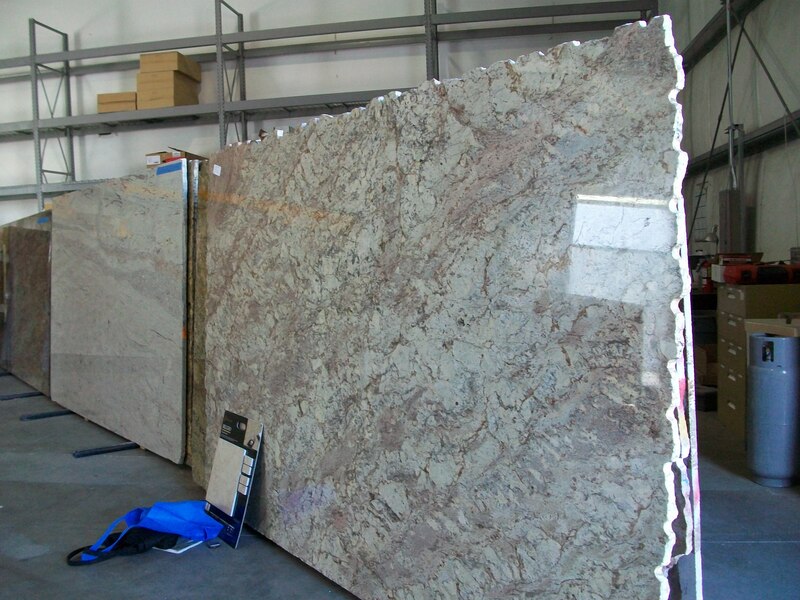 Our client selected Sierra Bordeaux for their granite slab countertop. 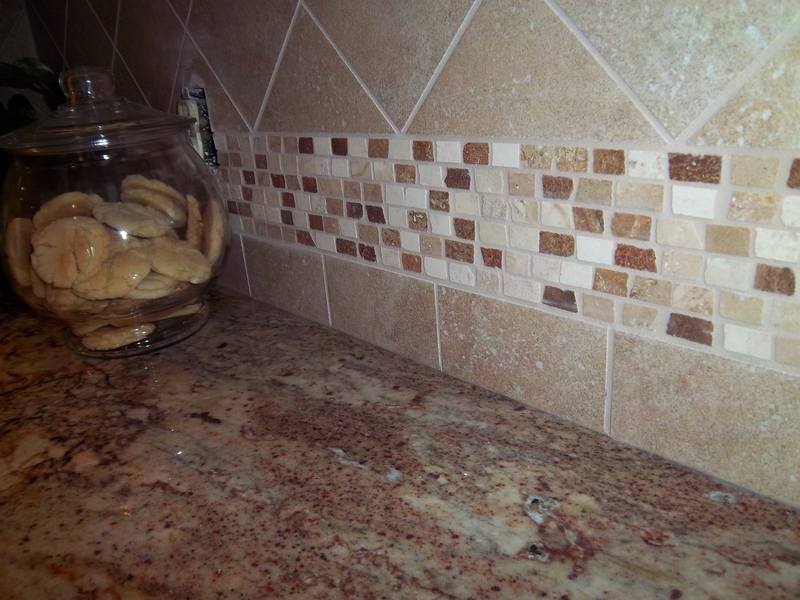 After it was installed the next step was to install the tile that had been selected for the backsplash. The customer went to the showroom and selected from United Tile. We then finalized the mosaic type, field tile and design. The end result was beautiful. First step. 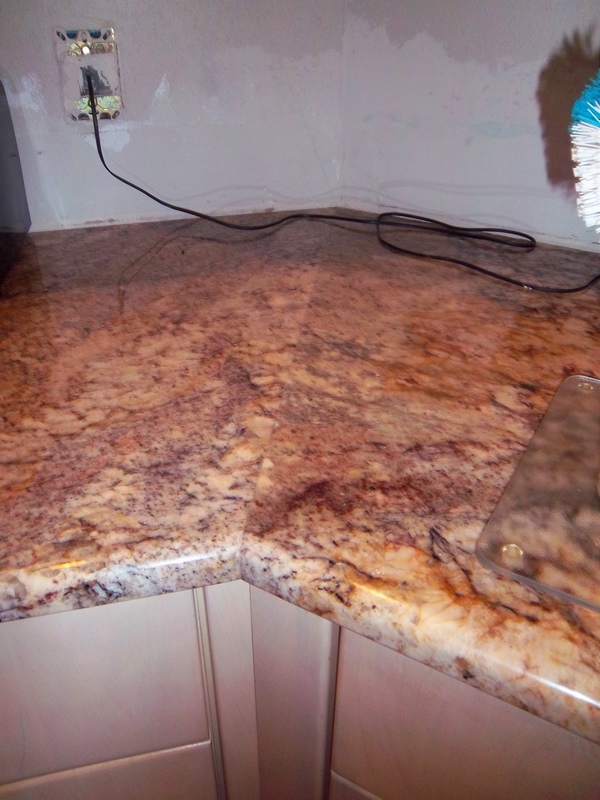 Granite slab without a backsplash. We needed two slabs for this project. Selection of field tile. The 6″ field tile yields an 8″ height when set on the diagonal. For the bottom the row the tile was cut in half for a 3″ border. 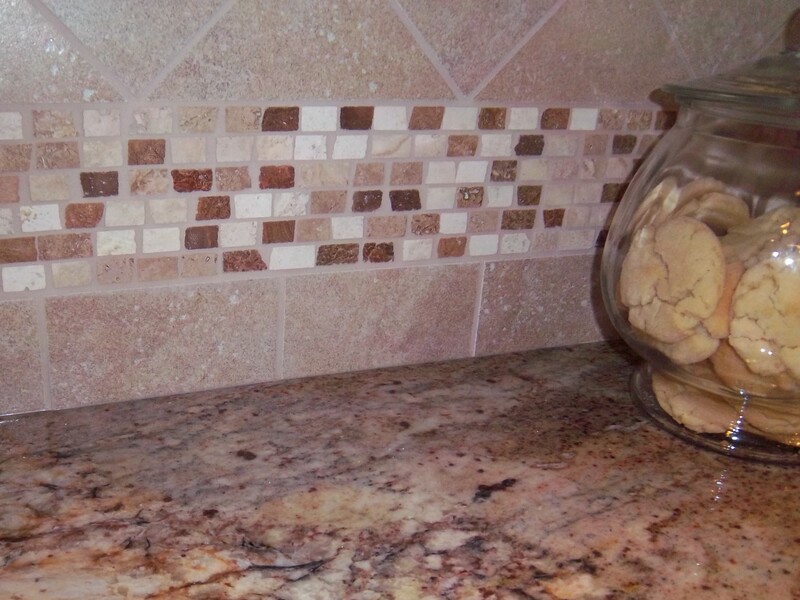 The mosiac is mixed stone of granite and travertine. Layout and communication with the installer is vital. A scaled drawing is necessary. 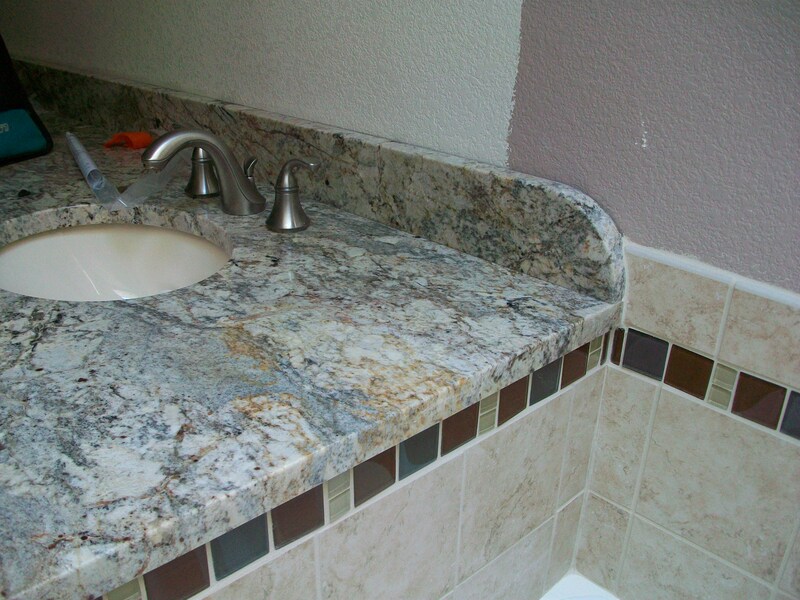 What a difference it makes to accent the granite with such a simple but striking tile combination. My thanks to my tile setter Brian who did a wonderful job. I made sure there was enough mosaic to add another row if needed. This is the easiest portion to adjust for height. The average space to fill from the bottom of the cabinet to the counter is 18″ but we only had 15″ to work with. He ended up using 6 rows instead of the 5 I drew and photocopied. 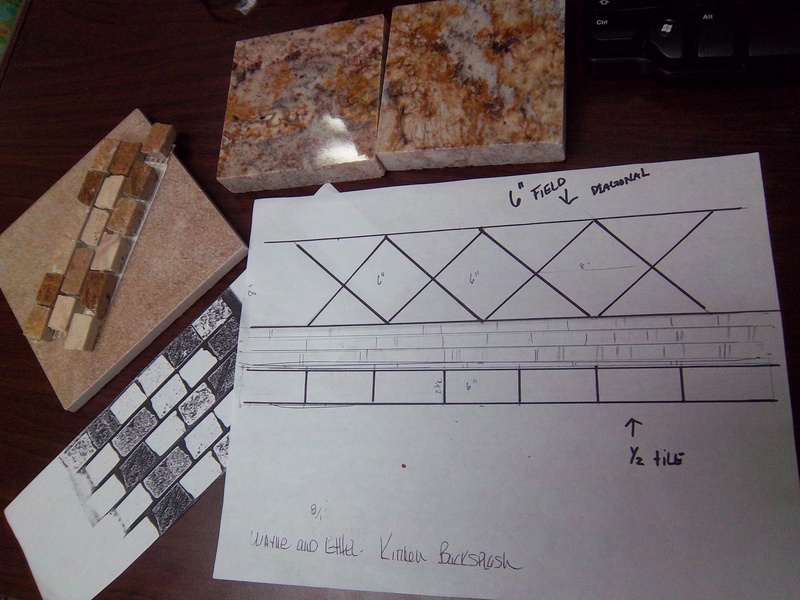 While the appearance of your new countertop is almost always the first consideration, function needs to be addressed. 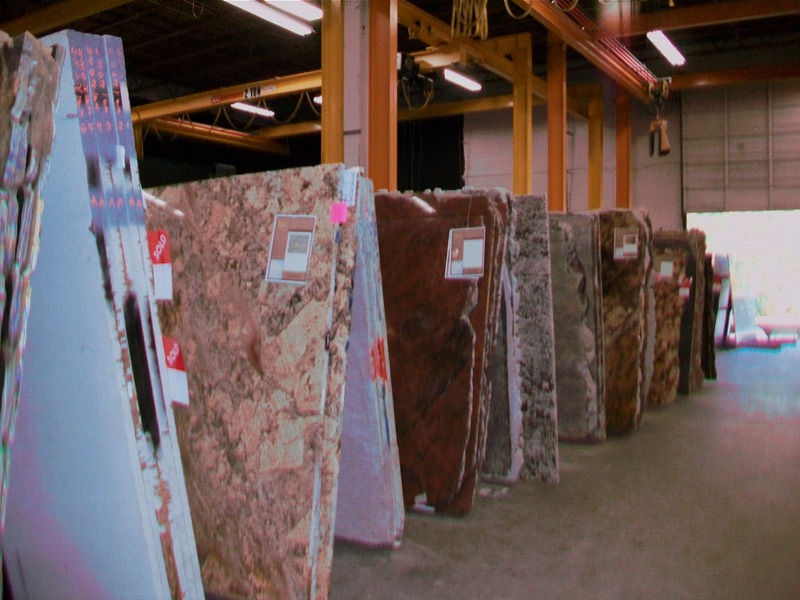 The three most popular selections are granite slab, acrylic ( corian, staron, etc, and quartz. With quartz and the acrylics you will know for sure what the final color will look like while the granite slab will have variations. 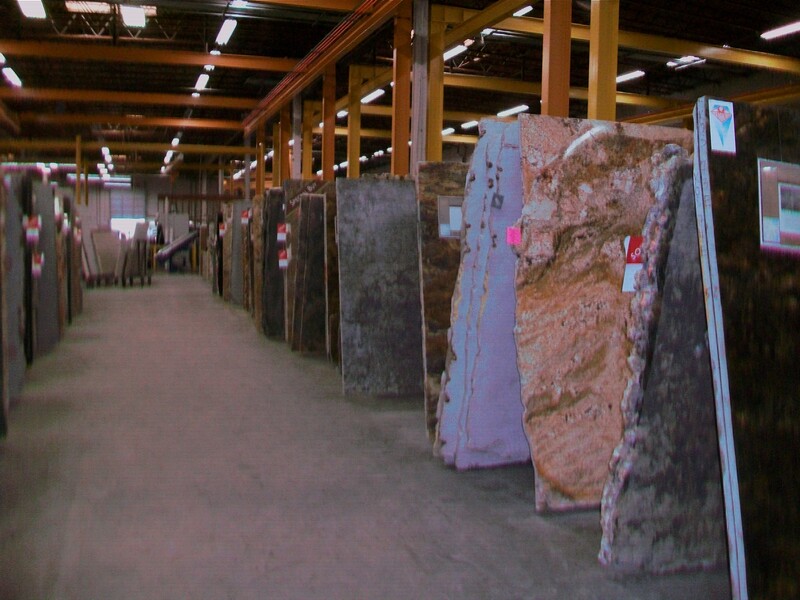 Each granite slab is unique. One of the most important aspects about slab granite is the matching of seams if there is a lot of movement in the stone. You can only get two consecutive slabs. That means that if you have a u-shaped or long kitchen that only two of the three seams will match closely. The third seam is matched as close as possible by the fabricator. Can you cut on any of them? No. Do you have to use hot pads and trivets? Yes. 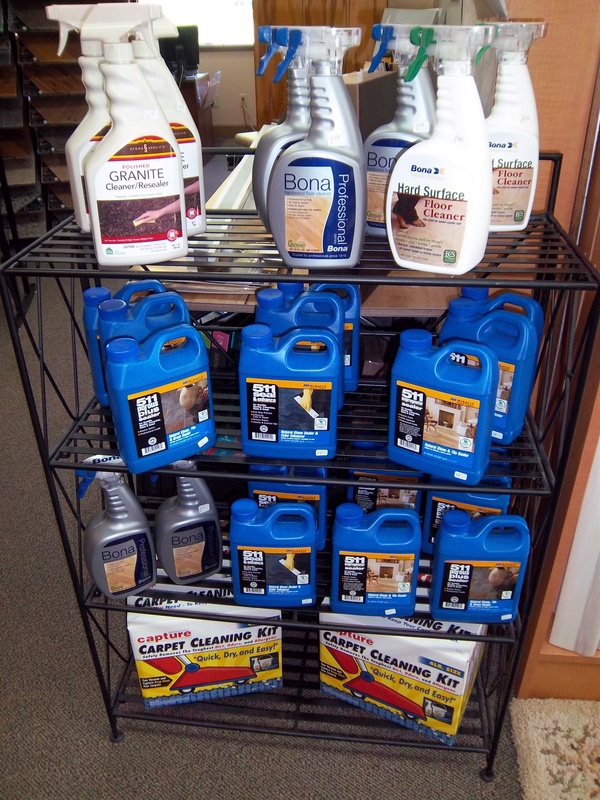 With all of these products reasonable care must be taken. The advantage of an acrylic is that the surface can be renewed if scratched. Of the three, only the granite requires sealing and periodic resealing. Don’t forget that you can mix the materials. For instance use corian for the work surfaces but select a granite with a lot of movement for drama and contrast. When you select the product here are the steps you need to consider next. 1. Take a close look at your cabinets. It is your cabinets that set the tone for your kitchen. The surface you select should compliment the cabinets. 2. Balance. All the elements should relate to each other. A black countertop set against white top and bottom cabinet will visually divide the kitchen and your eyes will focus right on the counter. A light to white counter will add freshness to an all maple kitchen if it seems dreary. 3. Find the perfect color. High contrast adds interest and it is always good to add another element to a mix of textures. For a more serene look, stay in the same color family as the cabinets. It is advised to go lighter or darker. The bolder colors are more contemporary and can be very dramatic. If your cabinets are light you can contrast or stay light and use a darker flooring. Red-toned cabinets blend beautifully with the darker countertops for a dramatic look. For balance please select a lighter color floor. The brown group from maple to walnut leaves a lot of options. Neutrals, blues, greens, rusts, and the grays all look wonderful with maple. The deeper naturals look good with alder. pine or light cherry. The deep dark wood cabinets, all look great with a warm neutral, or a soft white. All that being said….every room and taste is different and what looks great to you needs to be seriously considered. When you are thinking about replacement. Remember these things. Anything touching the surface of countertop, like an appliance garage, will have to be removed. All old surfaces have to be removed and disposed of. 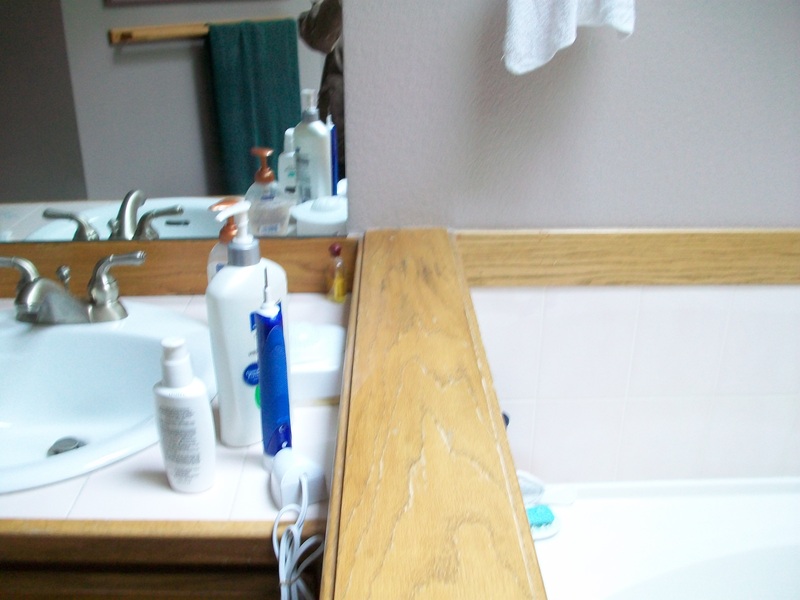 It is the perfect time to replace your sink with the newer undermounted models. 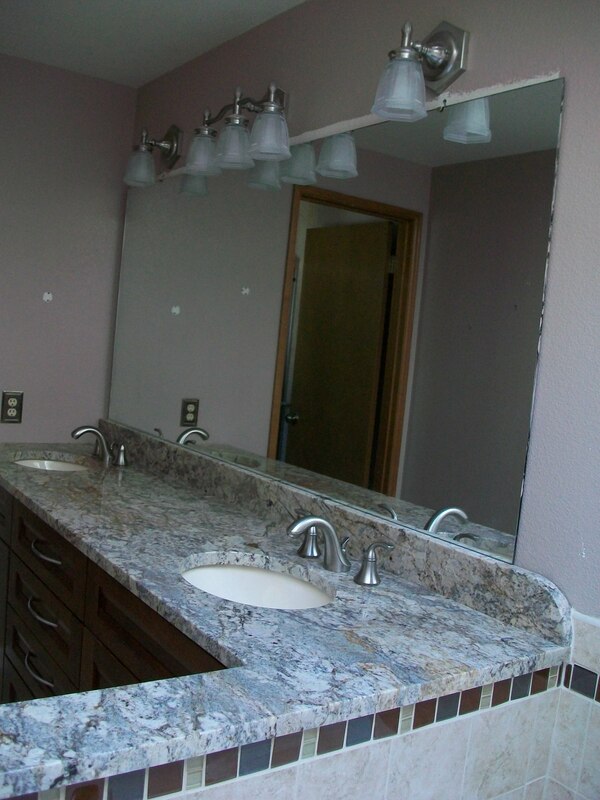 You will have hire a plumber to finish with the sink and install your faucets. 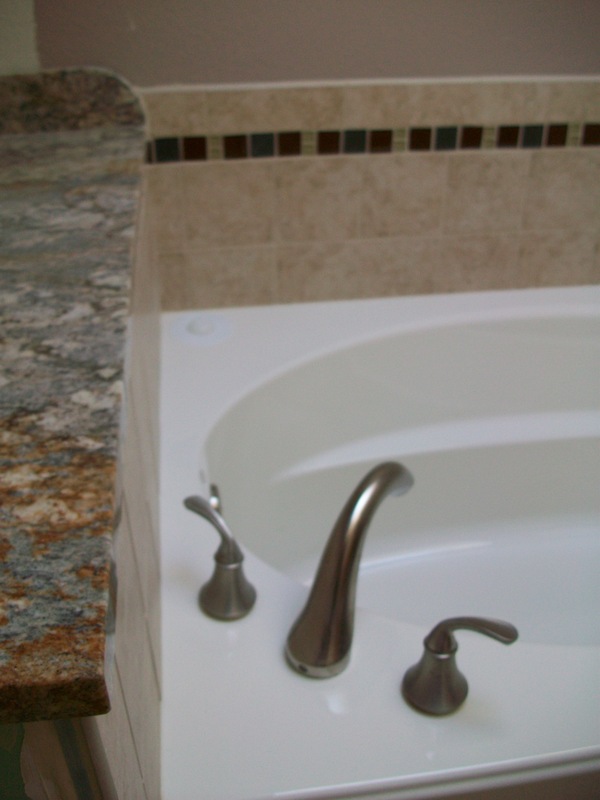 If you are getting new sinks and faucets, they have to be on site when they come to measure and template your counters. You can purchase sinks through the fabricators but you can also buy your own. 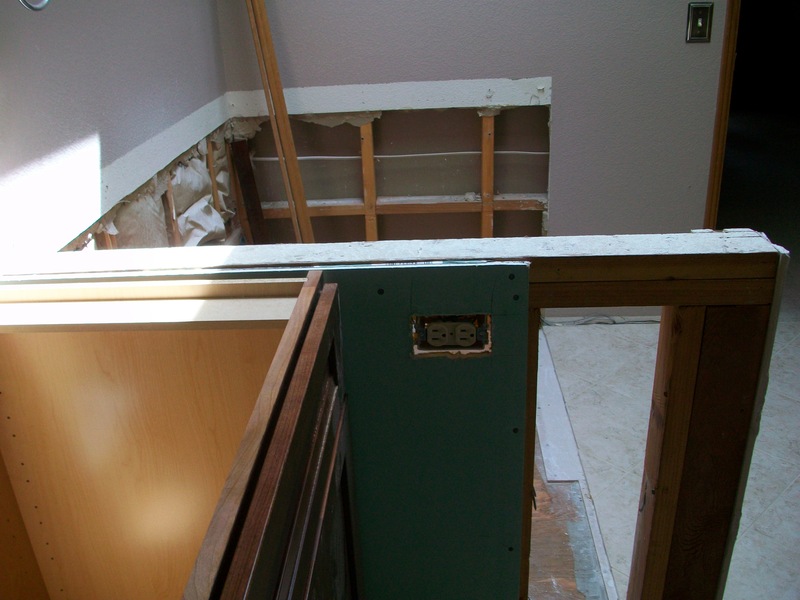 Be prepared for the possibility of wall damage with the old countertop is removed. Sometimes extra prep work needs to be done when the old backsplash is removed. Speaking of backsplashes. You can stay conservative with a 4 – 6″ backsplash of the same material…or you can bring the material all the way up to bottom of the upper cabinets, or you can select tile for a more custom look. Sometimes marble or granite are just not in the budget. One must not worry about this thought because there are some great alternatives. Actually we are seeing a switch from the high movement granites to the sleek look of quartz. But there are still plenty of options. 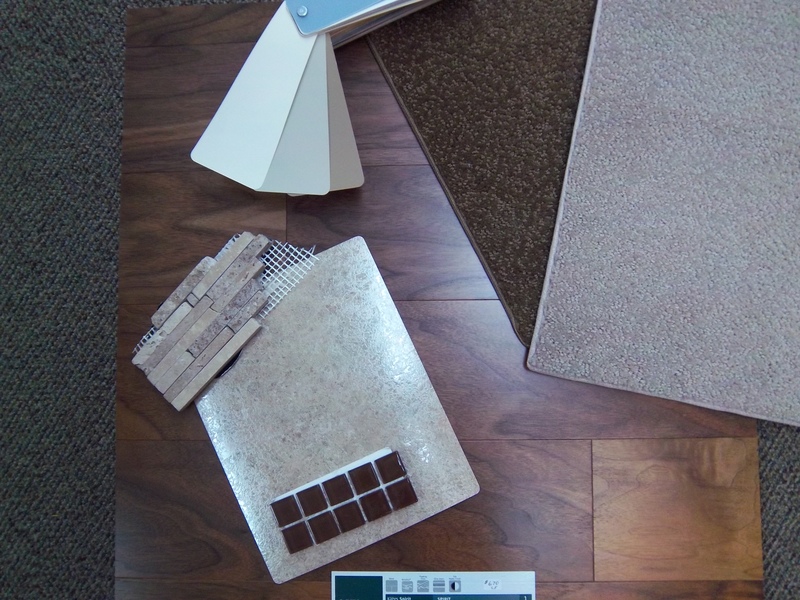 The above picture shows a color pallete of warm tones in the carpet and walnut floor while using High Definition Laminate. 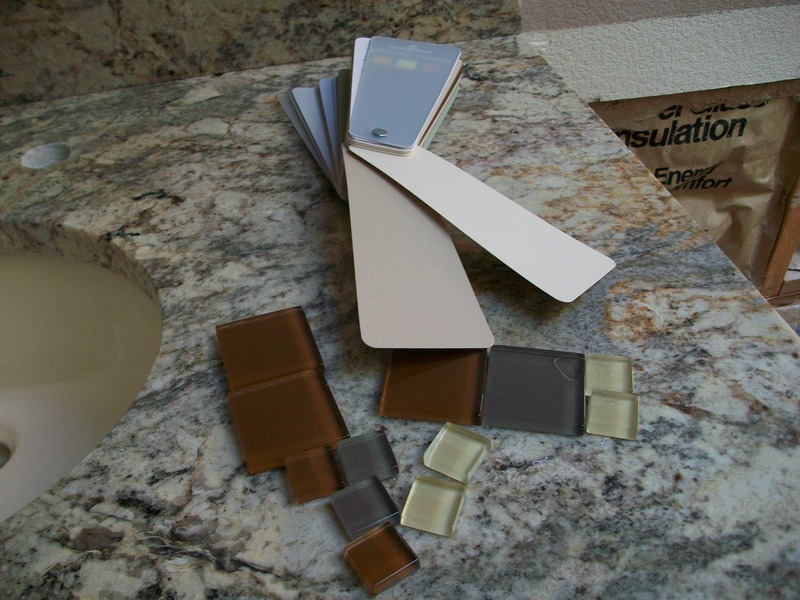 The paints range from a soft brown to a medium gray with a soft white accent for trim. The laminate looks like a quartz at a fraction of the cost. We like to use the simple squared or beveled edge to maintain a consistance edge all throughout the kitchen…..Bullnose is very dated at this point. Resist it. This next vignette is also built around the counter laminate. The new Formica 180fx has a large pattern repeat and comes in large sheets. It actually comes a full 60″ wide without any repeat which gives it a lot of movement. 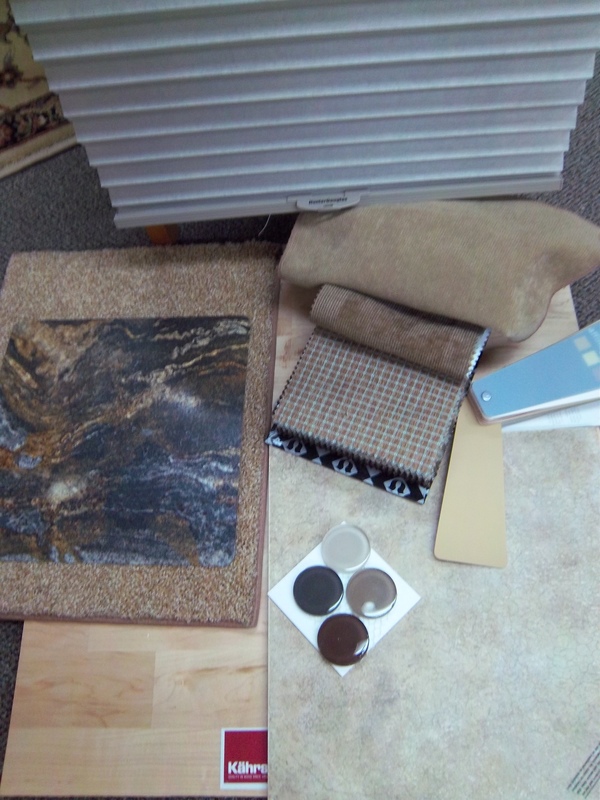 The fabrics have been selected to draw out the cool slate tones and also bring out the ginger/rust colors to warm it up. Do not be afraid to used cool and warm tones together. The blind is a very soft gray bamboo texture which is very interesting with the warm carpet. A gold to beige blind would have just washed out instead of adding an interesting element to the room. When using laminate you can splurge on other areas like using special tiles for a custom wall blacksplash. 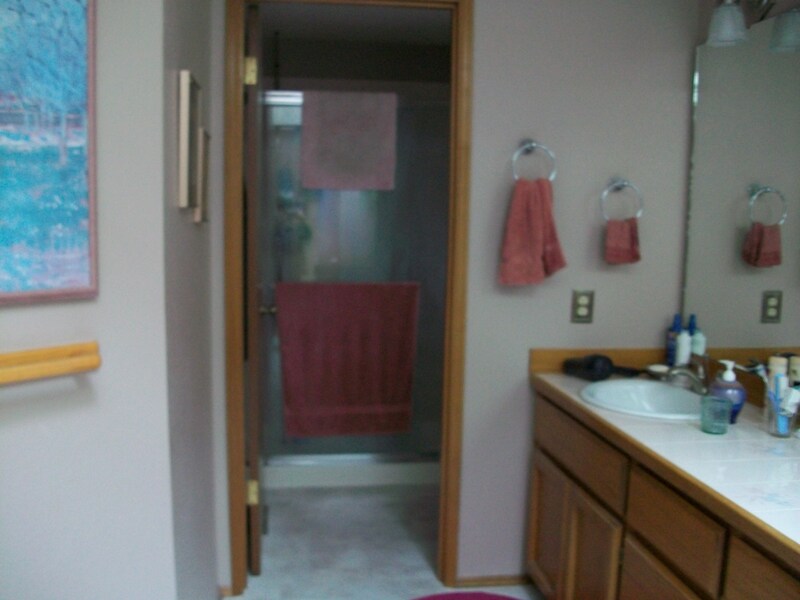 The tile to the right has sudbued colors found in the laminate. They coordinate very well. The maple floor lightens up everything and will make the countertop pop with contrast. Please come to our showroom at Allyn Interiors and we can put together a room for you that fits your budget. 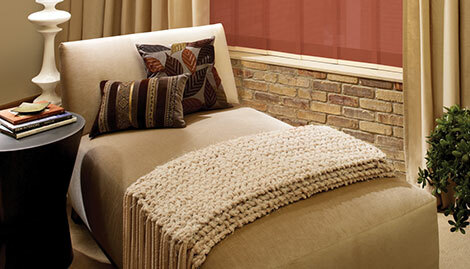 We specialize in backgound colors that come togther to enhance your home. If laminate is not your thing…let’s take a trip into the granite and marble world. Just remember…you may fall in love with a stone that you had not considered. Here is our project bathroom. We need to replace the tile countertop update the sink and fixtures and remove the old cabinet. The vinyl floor will come out and new tile will be installed on the floor and and the shower. All wood trim will coming out as it dates the bathroom. Actually the new cabinet is pictured here and it has been raised to match the height of the half wall. 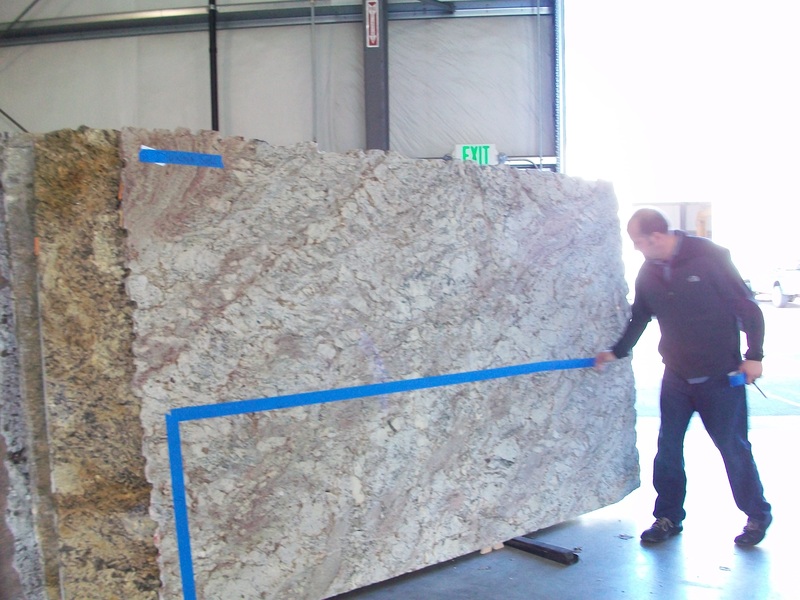 Now selecting the granite slab. 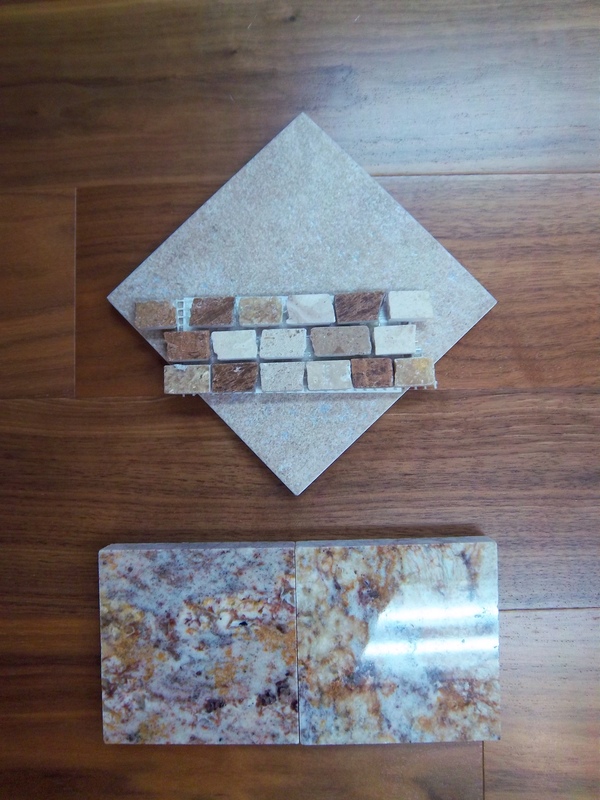 The floor tile and accent tiles come with us on the trip to select the slab. It was a good thing because we selected a completely different granite. When you see the whole piece…it is like…ohhh!!! I like this one…!!! This picture does not do justice to the beauty of this piece of stone. It was helpful to see how the swirls were going to look on the countertop. Although we have done this online with a digital camera. You do not have the option of selecting from the middle of the slab. We would have had to purchase the entire piece to do this. 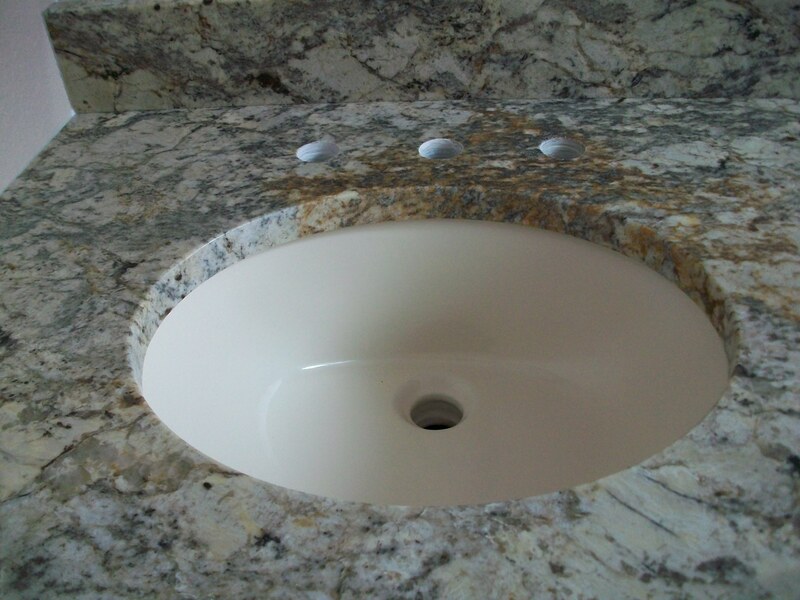 We also selected bisque undermount sinks. Paint and glass tiles. Here is the new countertop.. We have yet to paint and place the accessories.